Wärtsilä will provide an integrated cargo handling and fuel gas system for two new liquefied petroleum gas (LPG) carriers for Belgium-based owner Exmar. 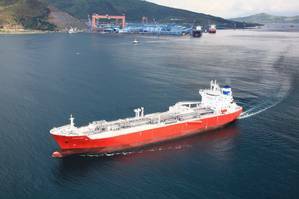 The 80,000m³ very large gas carriers are being built at HHIC-Philippines (Hanjin Heavy Industries & Construction Philippines) in Subic Bay, and will be the first vessels capable of running on LPG, according to Wärtsilä, who secured the order in July 2018. Wärtsilä, which offers 'LPG as fuel' as a fully integrated part of the cargo handling system, said th system is controlled by the Wärtsilä Nacos Platinum integrated automation system in combination with the company's remote process analytics software. The Wärtsilä Nacos Platinum automation platform combines and visualizes data from the bridge navigation and communication controls, the engine room and the cargo control center. This integrated solution enables high energy efficiency with lower carbon emissions, providing a positive Energy Efficiency Design Index (EEDI) for the vessels, Wärtsilä said. The integrated automation notably reduces both building and operating risks, the company added. Wärtsilä said it will also deliver its Airguard antipollution shaft sealing system, which provides extra security against oil leaking into the sea. The propeller shaft mounted additional 'air barrier' ensures complete separation of the stern tube oil from the seawater. "Wärtsilä has worked closely with Exmar Group for many years, and we are proud they have selected such a broad scope of our products, which have been combined into a smart marine solution for this new generation of LPG carriers. Wärtsilä's integrated solutions are designed to promote sustainable shipping and a lower total cost of ownership with lifecycle optimization," says Timo Koponen, Vice President, Processing Solutions, Wärtsilä. "These are 'game-changing' gas carriers and our aim has been to achieve the best possible operational and economic performance, while at the same time, ensuring the lowest possible environmental footprint. Wärtsilä's systems and solutions will help us meet these targets," says Pierre Dincq, Managing Director Shipping, Exmar. "Exmar has extensive experience with a variety of fuel systems, including HFO, MDO and LNG fueled steam turbines. Adding LPG as a fuel to this array of fuel systems will be beneficial to Exmar's reputation as a gas transportation expert."